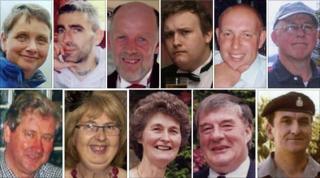 The names of the 12 victims of gunman Derrick Bird have been read out at memorial services in west Cumbria, a week after his shooting rampage. Thousands of people attended nine gatherings at 1145 BST for people to pay their respects to those killed by Bird, who later shot himself. Prayers were said for the victims, who included a 23-year-old, a couple in their 60s and Bird's twin brother. The services were followed by a minute's silence at noon. The locations of the gatherings were the towns and villages where the killings took place, as well as the West Cumberland Hospital where many of the 11 wounded were treated. The service in Whitehaven, which was attended by about 4,000 people, was opened by George Clements, Copeland Council's deputy leader, who said communities had come together in the wake of the tragedy. In an address which was also made at the other services, he said: "The world is watching West Cumbria. "We must ensure that we are not defined by the shootings, but by our response to them. "But above all else, we must remember our community, and show that we are there to support our friends and neighbours over the coming days, weeks and months. "I have been a proud member of this community for long enough to know that I can rely on each and every one have you to do just that." Investigations into what triggered Bird's murderous rampage are continuing. Detectives believe he deliberately targeted some of his victims and indiscriminately shot at others during his 45-mile rampage. The Sun newspaper has obtained CCTV footage from Seascale where three of the victims were killed. Copeland MP Jamie Reed has called for the local community to decide the shape of any inquiry into the killings. "I don't think it's for any politician to say what shape this inquiry should be. It's up to my constituents." He was speaking after the House of Commons observed a minute's silence ahead of Prime Minister's Question Time. In Whitehaven, where Bird killed fellow taxi driver Darren Rewcastle, colleagues at the rank sounded their horns in unison. Passing hill-walkers joined members of the tiny community of Boot to remember Bird's victims just a few hundred yards from where he took his own life. Local vicar, the Rev Ann Baker said: "Sadly, Derrick Bird's journey ended here and people were shot here. "One of the most prominent members of our community is still receiving treatment from gunshot wounds. "But I think it's important that we remember that lives can be rebuilt and throughout the whole of this area we will be joining together to help people come to terms with last week's tragedies." Friends of rugby league player Garry Purdham hugged each other and wiped away tears as about 200 villagers in Gosforth gathered in the village car park close to where he was gunned down. None of Mr Purdham's grieving family were present. His funeral is due to take place on Thursday. Funerals for Bird's other victims are due to be held next week. In Seascale, the service remembered 64-year-old Michael Pike, who was shot dead while cycling, Jane Robinson, who lived in the village with her elderly twin Barrie and was killed while delivering catalogues, and 23-year-old estate agent Jamie Clarke. Firefighter David Moore, 57, who is Seascale's representative on Copeland Council and tried in vain to save two of Bird's victims, said the community must now "try to move on". Other services were held in Cleator Moor, Egremont, Frizington and Millom. In Egremont about 2,000 residents attended the service in memory on five people from the surrounding area who were murdered. They were mother-of-two Susan Hughes, 57; ex-military man Kenneth Fishburn, 71; part-time mole catcher Isaac "Spike" Dixon, 65; church council secretary Jennifer Jackson, 68, and her husband James, 67. The mayor of Copeland, Mike McVeigh, said: "There is nothing I can say that will ease the pain." In the small coastal town of Millom, about 150 residents huddled under umbrellas and rain-hoods as drizzle accompanied the service. Town mayor Doug Wilson addressed the gathering and local priest Father Mark Houston led the service.